Many times back injuries result from hyperextension or hyperflexion injuries. Other times they are due to protruding vertebral discs that result in pain. Once the pain is so severe enough that interruptions in daily life occur, medications, physical therapy, or surgery are often necessary. Of the minimally invasive procedures for spinal surgery is Laser Disc Decompression (Laser Discectomy). This procedure requires less operating time, less post-operative pain, and faster recovery time. The spine is composed of 24 individual bones, called the vertebrae, which are stacked on top of one another. Resting below are the five fused bones of the sacrum, and the four fused bones of the coccyx. Together they combine to form the spinal column. There are three segments of the vertebral spine; Cervical (neck), Thoracic (chest), and Lumbar (lower back). The support of the vertebrae are the muscles and ligaments that are strung together to provide a stable and safe surrounding for the spine cord and nerves. 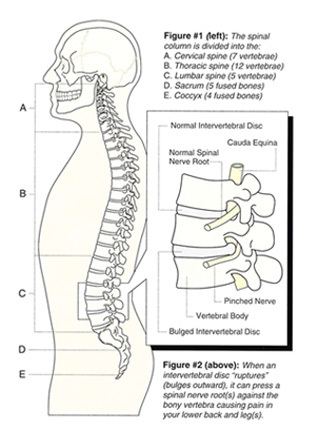 Each vertebrae is separated by an interverterbral disc, which acts as shock absorbers. They also allow for fluidity of the spine in motion. When a disc ruptures, it can bulge out along the sides of the veterbrae compressing the spinal nerve root innervating a specific area of the body. This may result is pain, burning, numbness, or weakness along the path of the nerve. Bed Rest, Medications, Physical therapy, or Surgery. Bed rest may be all that is required for some patients to fully heal and recover. However, many times the pain alone is not bearable. Some physicians reccomend the use of medications to reduce inflammation and provide relief to the affected area. Studies have shown that steroids and NSAIDs have been the most beneficial in regard to symptomatic treatment. Physical therapy such as gentle massage, exercise, and stretching have demonsrated a reduction in pain and other symptoms pre and post surgery. In some cases, surgical intervention can directly relieve pressure on the spinal nerve that is causing pain. Not only can it help return lost function back to an affected extremity, but it can help you get back to normal daily activities. At Northwest Brain and Spine Surgery, we tailor your treatment plan around your individuals needs.